Their concert on August 30th was recorded for possible release as a live album, however the project was shelved when it was found that the quality of the live recording was not up to par. Years later George Martin would revisit the tapes - working with the equilization and separation, and choosing the best tracks from their 1964 and 1965 Hollywood Bowl performances. With that, Capitol Records nostalgically released 'The Beatles Live at the Hollywood Bowl' in 1977. Following their shows in Los Angeles, the Beatles would conclude their 1965 North American Tour with an appearance at San Francisco's Cow Palace. Q: "This is a double-barreled question directed at both George And Paul, who are the two remaining..."
GEORGE: (anticipating the question) "We're not getting married, no." Q: "You're both the only bachelors, and you're not gonna give us any indication of what your matrimonial plans might be? GEORGE: (jokingly) "Well, soon we're gonna just get an answering service for that question." PAUL: (jokingly) "We're both queer anyway, you know." PAUL: "Write that one in your magazines!" Q: "Paul, do you feel that your vacation here in Los Angeles was a success even though you didn't have very much privacy?" PAUL: "Yeah. We did have alot of privacy." Q: "Did you mind the girls on the hill?" Q: "What was the most enjoyable part of your vacation?" PAUL: "Just lazing around, I think. Oh! Visiting Elvis! It was good, that." Q: "I'd like to ask this question of the most handsome member." Q: "Mister Starr, what do you think your basic appeal is to the younger generation?" Q: "I'd like to pose this question to Paul, if I may." PAUL: "We're all as important as each other, Dave. Let's face it, Dave." Q: (laughs) "Would you consider..."
Q: "Hi. Would you consider..."
JOHN: "Here again, Dave, eh?" Q: "Yes, I'm always everywhere. Would you consider the Hollywood Bowl the most important part of your tour this year, or for any year for that matter?" Q: "Ringo, I understand your wife is a hair stylist. Is it true that she's tried to change your hairstyle?" RINGO: "She used to be a hairdresser. She cuts it, but, you know..."
Q: "But hasn't changed the Ringo cut at all?" RINGO: "Umm, it changes a bit from month to month but nothing exceptional." Q: "Could you tell us what happened last night at San Diego? I understand that some fans almost got on the stage." RINGO: "That was after we left, actually." RINGO: "Wasn't it? I'm at the back, you see. I don't see so well." GEORGE: "Anyway, there was all bright lights around the stage. You couldn't see a thing, you know." PAUL: There was one or two that nearly made it, but they got beaten down." Q: "Do you appreciate women more now that you're famous?" 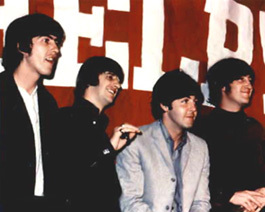 RINGO: "We've always appreciated them." JOHN: "No more, no less." Q: "John, your second book is slightly different from your first." JOHN: "I'm glad about that." Q: "Do you find it doing as well as the first? Any difference in sales, or haven't you been able to tell yet?" JOHN: "No, I haven't asked anybody, you know. They'll tell me when they're ready to tell me. It did as well initially. It won't sell as many, but it's a better book so I don't care." Q: "Do you plan another book in the near future?" JOHN: "I don't really plan 'em, you know. They just sort of happen. The publisher plans 'em, and I just sort of scribble." Q: "Is it true, in New York, you led a 'boo' for the police in the (Shea) stadium there?" PAUL: "Umm, no not really, you know. But yeah, I think a couple of the coppers were getting some fella 'cuz he'd run up on stage. They were thumping him up a bit." JOHN: "Looked more like Madrid." PAUL: "So, it was just a 'boo.'" Q: "Ringo, did you enjoy working more in 'Help' than in 'A Hard Day's Night'?" Q: "Since your tours over here are so successful, why is it you only come over once a year?" JOHN: "Because they wouldn't be successful if we came too often." Q: "Will you go to Germany eventually?" PAUL: "We don't know that. Brian (Epstein) decides where we go." JOHN: "It's a big market, it's worth going to, but it's the time, you know." Q: "May I direct this question towards Paul and to John. I understand you are Dylan fans." PAUL: "We all are. All of us are." JOHN: "We all are. Even George is." JOHN: "Even George and Ringo like him." GEORGE: (jokingly) "Even the non-musical members of the group." Q: "I don't want to correct Ringo, but uhh... you'll be back from San Francisco at the time of the Dylan concert..."
RINGO: "We're playing the same night." JOHN: "We play the same night that he's here." GEORGE: "And we leave on Wednesday for England." JOHN: "We saw him in Britain, you know, and it was good. But we're not gonna 'flog' it." Q: "Did any of you help Mr. Epstein write his book?" JOHN: "No. He did a bit, but we couldn't." Q: "A couple of the tunes in 'Help!' sounded as if the sound might be changing just a little-- getting even more traditionally blues oriented, maybe this is just an opinion. Do you feel that there's any change?" PAUL: "We try and change every record. You know, we've tried to change from the first record we made." GEORGE: "And if you progress musically then you naturally change." JOHN: "If you play our early records and the late-- even though we haven't made all that many-- there's alot of difference." PAUL: "We're not trying to do it consciously, you know, particularly." JOHN: "Even recording technique. If you improve that slightly-- your sound changes, basically." Q: "Ringo, I understand that the record album, 'Help!' has different numbers in the English version than in the United States version. Is this true, and if so, why?" PAUL: "Yeah. We're in Capitol (records) now." RINGO: "The English album is 14 tracks, and they're all our numbers. And on the American one-- I don't know how many tracks are on it, but then you've got some..."
PAUL: "There's seven of ours." GEORGE: "The thing is, Capitol issue all sort of mad stuff, you know. It's nothing to do with us. We take 14 tracks to be put out, but they keep a couple and put them out later." PAUL: "But it's a drag, because the album-- We make an album to be like an album, and to be a complete thing." JOHN: "We plan it, and they wreck it." PAUL: "No offense, Capitol-- but we send it over here and they put the (movie score) soundtrack on. And, you know, if someone is gonna buy one of our records I think they want to hear us and not soundtrack." GEORGE: "They even changed the photograph off the front and put something daft on." PAUL: "Yeah. Either that or they should make it all soundtrack." JOHN: "As for Capitol-- they'll come 'round after we'll settle it." Q: "John and Paul, you recently produced a record by the Silkie." Q: "Do you plan to do alot of A&R work, or is this just a one-time thing?" PAUL: "We just wanted to do it, you know. And it was a song that we'd written." JOHN: "And we'd been off a week. We had nothing to do." PAUL: "We had nothing to do and so we asked if we could do it with them." Q: "Do you think you'll do any more?" Q: "John, did you know that four girls have been circling above your home in a helicopter?" JOHN: "I heard about two girls that had been in a helicopter, but that's all." JOHN: "Four? Were they driving it?" Q: "What do you think of the groupies or the girls that make a business of chasing groups?" JOHN: (comically) "I think it's terrible!" Q: "Do any of you go to church?" Q: "George, have you and the Beatles ever been to South America and Russia for a tour?" JOHN: "The Russians don't like us." GEORGE: "And we don't particularly want to go to Russia." PAUL: "They burn us there." GEORGE: "And South America-- I don't think they've ever heard of us down there." PAUL: "Yes they have, George. We nearly went this time 'cuz Brian (Epstein) wanted to see Mexico." JOHN: "We tour the places our manager wants to see. He takes his camera. So, we'll be going there pretty soon, eh Brian?" Q: "What's your program for the next few months-- like concerts or..."
GEORGE: "It depends on what Mr. Epstein wants to see." RINGO: "We've got a month off as soon as we get back, and it'll probably just be TV and records and..."
PAUL: "TV and bullrings, and things like that. He likes that sort of stuff." Q: "There have been some quotes on some radio stations in which you put down the movie magazines. You said that the things they are saying are unfair-- like Ringo always waves (at the fans) and some movie magazine said that he did not wave. And television proved it. My question is-- Do you feel that there is a difference between the treatment that you have received by movie magazines and all other magazines, and teenage magazines specifically?" JOHN: "Well, the teen ones and the movie ones are written by people that never leave the office, and they just make it all up and it's alot of rubbish. But there's nothing we can do about it because the liable laws are so peculiar over here. The movie magazines that we were talking about are the same kind of thing." GEORGE: "But the thing is-- the teen magazines like '16 Magazine,' even though the stuff they write is still rubbish it's not as bad as the movie mags. But it's still rubbish." PAUL: "But there's some great magazines, you know, and some crummy ones like anywhere. But there's just a few more crummy ones over here, I think." PAUL: "I mean, you know, you've got to admit it. If someone puts in-- 'Is Richard Burton dying?'" JOHN: "I've just read about how I'm leaving the group, as well. What can you do about that!" PAUL: "He's leaving the group, definitely. And I'm definitely married. It's fun to read." JOHN: "You can't sue 'em here. What can you do! You can't ring 'em up and say, 'I'm not leaving the group. Where'd you get this from?' because then they get big publicity out of it. So you just gotta leave it." JOHN: "But we just keep telling everybody that they're lousy, and hoping the kids will gradually caughten-on. You know, just buy 'em for the photographs and don't believe all the rubbish." PAUL: "The thing is, if you read 'em like fiction instead of fact it's much better, you know." JOHN: "But you get all these letters saying, 'Are you really leaving?' or 'Is Paul married?' and 'Have you got twelve wives?' and all that stuff, you know." PAUL: "I love 'em. It's nice to read I've got twelve wives." Q: "John and Paul, in creation of a Beatles song between inception and actual creation of the product, what's the process and how long does it take?" PAUL: "It's just sitting down and working it out, you know. It can take days or it can just take a couple of hours. Depends on how easy it is. Sir." Q: "Paul, how much of your personal life do you feel you have a right to keep private, and do you believe in being dishonest with your public to do so?" PAUL: "Dishonest? I don't know really. Umm, I like to be, you know, quiet when I'm not working. But I can't have it quiet all the time, but I like it quiet, you know. But we expect it-- all of us expect it when we come on tour. Like this five days in Los Angeles, you know. And we expected it." Q: "I'd like to ask Ringo which country he enjoyed touring the best, of everything." RINGO: "America. I enjoy America, you know. It's so different from England. I mean, all the other places are different, but at least you can speak to people over here." Q: "Paul, how do you go about selecting the songs you're going to do for a concert?" PAUL: "On a concert, we just do songs that are known. That's all. So we just pick the songs that are best known." Q: "Is there one particular favorite that you do at many of the concerts?" PAUL: "We do most of them... Most of the ones that we do now we've done at all the concerts. All our records, you know." Q: "Which group do you consider the largest challenge to your popularity? Could I ask Paul?" PAUL: "Umm, yeah. (laughs) You can ask me. I don't know, though." RINGO: "There's a new one every week, you know." PAUL: "Yeah. The Silkie, I think. Big challenge there. Up-n-coming." Q: "Do any of you actually get any fan mail at all, or is it channeled through your fan clubs?" GEORGE: "Yeah, we get it because '16 Magazine' prints our addresses handily for the fans." Q: "Do you ever actually answer it? Also, do you accept registered letters from fans?" PAUL: "Yeah. We get alot of mail that we answer ourselves. But so much of it goes into fan club branches and offices all over the world." JOHN: "The main trouble with the mail from America is that they put self-addressed envelopes with American stamps on. If they'd thought of it, they'd know it doesn't work. They should put English ones on." Q: "Would you mail it if they put English ones on?" JOHN: "We answer quite a bit. Especially when we get months off. You're standing there at nine o'clock waiting for the postman for something to do." Q: "Paul, you've been described as having the face of a typical matinee idol. How do you feel about this?" PAUL: "I don't feel about that, you know. I hate that. I'm not." Q: "Last summer in San Francisco, a doctor said that the Beatles were instruments of the communist propaganda-- that you were softening up and corrupting America's youth. What did you say to that?" JOHN: "I think he should see a doctor. that doctor. He must be mad. You know-- Doctor of what! I mean who was he, you know. So many nuts over here, they call themselves doctors... and Sergeants and things." PAUL: "We're all capitalists, anyway. Don't worry. CAPITOL-ists! Get it?" RINGO: (jokingly) "It went down well in Chicago." Q: "Do you have any people taking this seriously?" JOHN: "Well, when we first came out the Russian papers knocked us, but then they decided we were alright. So we're sort of almost 'in' in Russia-- Accepted. But I mean, he wasn't even Russian, was he." Q: "Among the youth in Russia, do the Beatles have a tremendous following, just as in the rest of the world?" JOHN: "I don't think it's anything like that, but it's just that the papers changed their tune. We noticed in 'The Daily Worker' in Britain, at first they were saying we were capitalist things, and then they changed and said we were sort of raising the workers up to fight against capitalism. So they've changed their tune a bit. That's the way we found out. The 'Daily Worker' is the British communist paper, you see." Q: "There was alot of criticism over your being awarded the Royal Order of the British Empire..."
GEORGE: "We didn't get the 'Order.' We got the MBE whatever that one is. Not the OBE." PAUL: "Not the Royal Order." GEORGE: "The Order's a better one." Q: "The first step on the way to knighthood, right?" RINGO: "It isn't at all." GEORGE: "We don't give enough to charity to be..."
Q: "I see. But anyway, there were some members who had received this same award but turned theirs in. What is your reaction to this?" JOHN: "Ours were Civil awards, and theirs were sort of, what are they..."
JOHN: "...yeah, and they got theirs for killing people. And I think, you know, we deserve ours for not killing people." PAUL: "Anyway, you know, we've got 'em and they haven't." Q: "What American group do you admire the most?" RINGO: "The Byrds, yeah. And they admire the Lovin' Spoonful." Q: "I'd like to direct this question to any one of you. Is it true-- We heard a rumor over here that your British version of the last movie, 'A Hard Day's Night' was longer than ours over here. Is this true?" Q: "And were there portions, a great deal of the movie 'Help!' cut?" PAUL: "You get nearly the same film, only we had to... The thing is, for America, we had to cut out the word 'toilet.'" PAUL: "We had to call it a bathroom for America." JOHN: "That's true. We actually cut out a few words because they wouldn't take it over here." Q: "What do you think of your movie, 'A Hard Day's Night' Being nominated for an Academy Award?" JOHN: "It was funny, wasn't it?" Q: "There's been alot of controversy over the fact that, since there's so much screaming at your concerts, you don't sort of rehearse them before, or worry too much about them. Is that true?" PAUL: "Well, we never have." GEORGE: "We always sing songs that we've been... that we know. We must know 'em 'cuz we recorded 'em, so we don't need to rehearse 'em, do we." RINGO: "And it doesn't bother us..."
GEORGE: "The only thing we've got to know is which ones we're doing." PAUL: "The thing is, you know, we still don't rehearse for places where they can hear us, like on the Ed Sullivan show. And, you know, when it comes on television you can hear it, sort of, much better than at a concert. We still don't rehearse for that. We never have, you know." JOHN: "We rehearse the sound with the technicians, not the songs." Q: "I think we've met before." Q: "And I just have a feeling that you have turned a little bit anti-press." RINGO: "Not since YOU left." JOHN: "That's just because we wouldn't have you up to see the pool, that's all." Q: "No, that isn't it.... it's just that I was promised many times and told many stories but, uhh..."
JOHN: "Well, what about all the things you... all the photographs you promised?" JOHN: "...robbed all the plane and then you left 'em. I mean, that's no good, Kurt." RINGO: "We heard about ya." GEORGE: "Bad Kurt! Bad, naughty Kurt!" GEORGE: "Do onto others as you would do onto you, Kurt." JOHN: "...all the stewardesses waiting for their photographs." M.C: "Let's continue this next year." Q: "I had a serious question and you didn't answer me." PAUL: "We love ya, Kurt. Love ya." Q: "You do love me?" Q: "Well, I love you. But I didn't feel the love because I never saw you until today." RINGO: "We just didn't want to pollute the pool." 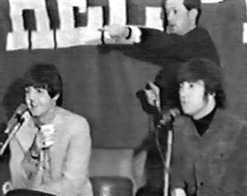 M.C: "In a few moments the Beatles will receive an award from the hands of Mr. Alan Livingston, president of Capitol Records. 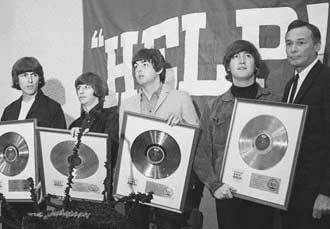 This award will be the coveted Gold Record, awarded by the Recording Industry Association of America..."
M.C: "...on behalf of the Beatles' latest soundtrack album entitled, 'Help!' To qualify for Gold Record status, a million dollars worth of sales are required, and this level was acheived scarcely two weeks after the release of the album." JOHN: (comically) "Give us the money!!" M.C: "That will be seven out of seven for the Beatles. Seven Gold Records for seven albums released. (Help! was the seventh of the original 'American' releases.) By Monday we expect to receive notification of the Gold Record status for their latest single, also entitled 'Help!' Now, to perpetuate that midas touch with Gold Records, Mr. Alan Livingston." LIVINGSTON: "I might say that Capitol Records, which is just a little bit older than any of you, has never in it's history experienced the phenomena of the speed of your success, nor the depth of your success, nor the continuity of your success. Going way back to our first hit record of Ella May Morris's 'Cow Cow Boogie'..."
JOHN: (jokingly to Paul) "Oh Yeah!!" PAUL: "I remember that one!" LIVINGSTON: "...which was recorded before you were born." LIVINGSTON: "And right up to the present. It's something which will probably go down in history. And I'm very happy to continue this habit of presenting you with a Gold Record." JOHN: (jokingly) "I'm glad you've got four. I'm fed up with fighting for one!"